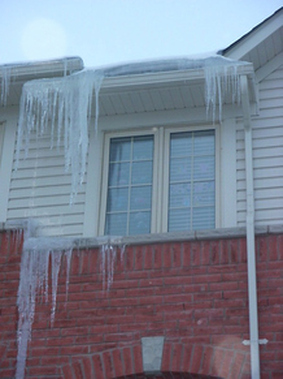 In the winter time, you may experience leaks even with a new roof. This problem is due to inadequate insulation or another source of heat loss such as an unsealed attic hatch or the heat generated from pot lights. When heat is lost through the roof, the snow at the top of the roof melts and flows downward to the bottom of the roof. There, the roof stays cold because of cold winter air entering through the soffits. Since it is the coldest area of the roof, the melted water from the top will freeze under the blanket of snow at the bottom and in the troughs. Snow that melts later in higher temperatures cannot drain properly through the ice and eaves troughs. The water will instead travel up the shingle, resulting in a leak. A proper ventilation system that circulates air through the attic will prevent this. Also, consider upgrading to ice & water (at cost price with us) for the first three feet and possibly adding extra protection for the next three feet or more. Ask your salesperson for his or her advice on your type of roof. Sloped roofs greater than an 8/12 pitch generally do not require an underlayment.